Key Takeaway: Fashion has undeniably changed the world; however, it’s so easy to get carried away by it in so many ways. Purposeful fashion is rooted in awareness towards self, others, and even society; and it makes the most out of “just enough” for your life. In today’s world, there are few things that are as influential as fashion. Entire industries have been built around it – from fashion houses haute and not-so-haute to the stores in shopping malls and everything in between – and relationships are forged over it. Just as Italian food has colonized the world (a phrase I borrow but wholeheartedly agree with from my culinary heroine, Nigella Lawson), fashion has become a global monarch. Dress codes and office outfits. Weekend attire. Magazines and walking showcases we call fashion shows. And a lot more. Fashion has even, in a way, shaped the way all of us think about what we wear on a daily basis. Everything you see on the shelves and racks today is a result of a collective thought on what’s “in” (or other qualities, like timeless excellence or uncompromising comfort) and of course, unless we sew our own clothes, we have no choice but to follow. And why not? People want to feel good about themselves either way – that extra boost of confidence from snazzy kicks that make everyone’s heads turn, or the not-so-eye-catching but irresistibly comfortable you-know-whats (“feel good” in a different way). It’s even in a way a Christian commandment to dress nicely, as our bodies being the temples of the Holy Spirit need to be in mint condition – who would want to go to a shabby building? It’s true that clothes don’t make the man, but as fashion designer and filmmaker Tom Ford said, “Dressing well is a form of good manners.” It’s a practice of both Awareness towards Self and Others: You respect yourself and your body by taking care of its external condition (or appearance), and you respect others by showing them you’re a person who exerts effort to take care of yourself – and, let’s face it, everyone will subconsciously make a judgment, however slight, of you based on how you dress up. Of course, awareness wouldn’t be complete without purpose, and so today, I would like to invite you to join me in the discussion on dressing purposefully. What does this mean? Simply put, it’s all about making the correct choices when it comes to what to buy and what to wear. Choose quality, not quantity. And by quality, I don’t just mean your clothes, shoes, and accessories should be of good build, but also spiritual quality: Would you use it often or not? Would you get it because you like it, or because you were pressured into it? Would it be able to adequately clothe you in every situation or event you go through? We also talk about social quality: Where were your clothes made? Are the people who make them being treated well for it? Are the materials sustainable or friendly to the environment? Are they going to break easily and thus be “disposable”? On the other side of dressing well as good manners, we also need to keep things in balance. As much as we should live lives of love and respect to others, we cannot and should not be people-pleasers. We shouldn’t overhaul our wardrobes every month just to have others praise us for our constantly good and “hip” looks. We should still retain a sense of identity that’s also reflected in how we suit up – that shows how we are being ourselves and not trying to be someone we’re not. This is where the adage “dress to express, not to impress” comes in. Don’t think of impression as the end goal; rather, impress by how you express. You can also read it this way: Dress to express respect for others and yourself. I personally like a smart casual look as my daily outfit, always with a pair of leather lace-up boots. I choose my boots not just on their appearance and relative comfort, but also on how durable and tough they are, and how well they can keep my feet protected (dress boots are of course a different matter). I usually wear jeans, as they are so versatile and stylish yet functional. I choose my shirts based not on the trends of today, but on timeless and classic looks and how I can dress up a casual outfit or dress down a formal one depending on the circumstances. It does seem like I try to “cram” as much utility into the clothes I wear as I can. To a certain extent, yes, this is what I do: and that is the magic of simple but smart living. I don’t buy for the sake of buying or having clothes, but rather for the sake of reason – and that’s where I put in style and responsibility. By relying on less items in my wardrobe, and making the most out of the relatively little I have (in terms of usage and outfit combinations), I get to use my clothes with purpose. Aloy Chua is the Co-Founder and CEO of TDY. His column, Today, discusses everyday living in relation to TDY’s philosophy of Higher Purpose Through Love. He’s also the co-founder of the Roots Collective, a community hub for entrepreneurs, and a freelance systems consultant and writer/editor, and loves reading about fashion, technology, travel, entrepreneurship, and healthy living. 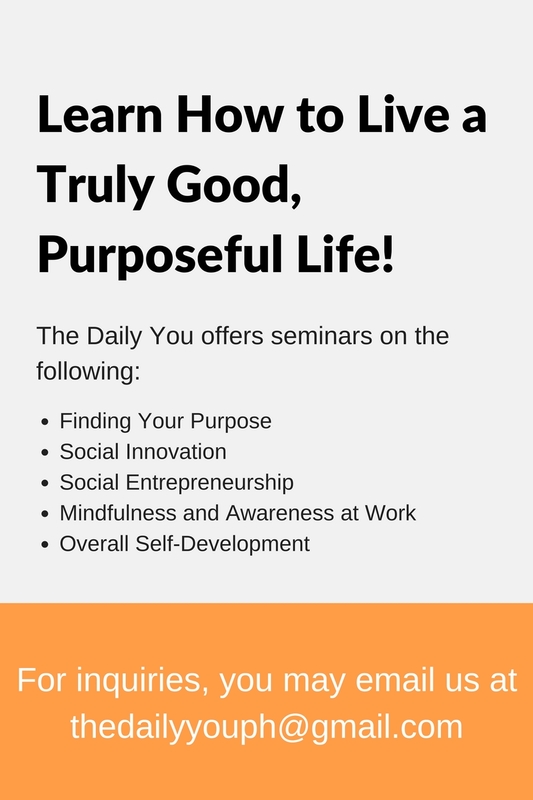 Find out more about living The Daily You on our About Page. Tags: clothes, fashion, Purpose, shoes, TDY, The Daily You. Bookmark the permalink.